ADAGIO continued to be our magic carpet to cruising areas near and far this year, beginning in New Zealand, where we cruised in company with friends, as frequently as the weather allowed. Dorothy learned to make soft shackles out of Dynema core line, and we don’t know how we got along without them for so long. She also began to write a cooking blog, http://www.cookingaboardadagio.com, so that we could have quick access to our favorite recipes and cooking techniques, and so that we could share these with others. On January 21, 2014, we set our anchor securely in Orongo Bay, Bay of Islands, and prepared the boat for the onslaught of ex-Cyclone Lucas. Our hurricane-hole in the bay where our ex-house was located proved to be excellent protection. After the weather had cleared, we cruised among our favorite islands, Urupukapuka, Moturoa, Te Pahi Islands and Te Puna Inlet, testing setting and reefing our sails. 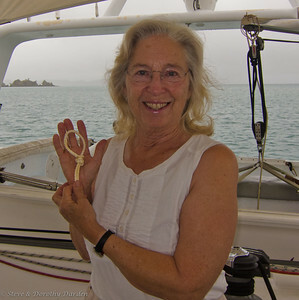 When anchoring, we used our new Dorothy-made “Soft Shackles” to connect the anchor bridle to the anchor chain, with great success. It is much quicker to attach and detatch than the Icycle Hitch that was used previously. On the 13th of March we prepped the boat for another tropical cyclone that was approaching New Zealand from the north. As we were anchored in the SE side of Uruti Bay, with 40 meters of anchor chain deployed, TC Lusi brought gusts of 45 knots between long spells of 35 knots of wind. Heavy rain and large coastal waves and storm surge were forecast as well. Thirty-knot winds continued to blow in our anchorage for the next two days. After the storm, we took turns bicycling to the Waitangi Reserve and the amazing BOI golf course, with some of the most beautiful views in the area. In the center of the small park on the waterfront is an upright piano on wheels, painted beautiful colors. As we worked on our iPads, young people from different countries, sat down at the piano and play (Beethoven today by a German backpacker). All of the pianists are young men and women, usually with backpacks, and very talented. Every park needs a piano. 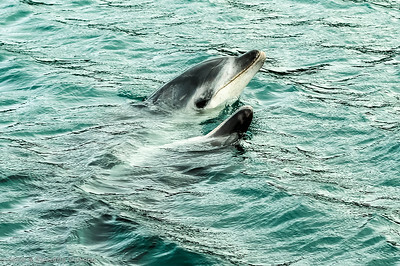 By the 1st of April we were on our way to Whangarei, via the lovely anchorage at Whangamumu, the location of a derelict whaling station, now a park, where during previous visits we have observed a pod of bottlenosed dolphins up close. Our first big project we had planned for Whangarei was to replace our genset diesel. The first Kubota engine we had purchased long distance turned out to be a scam-from-Japan when we inspected at Stanley Marine. It took some string-pulling to accelerate delivery of a fresh Kubota to the workshop of diesel engineer Tim Brown. Meanwhile our Aussie friends Ian and Ellen followed the track of Cyclone Ita across the Tasman. Their arrival was especially timely as Ian is a talented, can-do-anything “Sparky”, who made a big contribution to the replacement of the entire Fisher Panda wiring harness. Once the genset re-installation was completed, Tim did a 4,000 hour total-service of our two Yanmar propulsion engines. Tim’s work was slightly delayed when his American Bulldog gave birth to 15 puppies! Next on the slippery calendar was a haul out to replace both of our Kiwiprop propellers with Max-Props and a refresh of the bottom paint. The Easter loooooooong weekend interfered with this plan, as workers in NZ took advantage of Easter Monday and ANZAC Friday both falling in the same week, to take a 10 day holiday (from running boat hauling facilities and such). Day One: On 11 May, we were topped up with fuel and water, and well-provisioned for our passage to New Caledonia. With four people on board we had the luxury to set the watch schedule for 2 hrs on and 6 hrs off. The first night was a near perfect moonlit passage, followed by Albatross soaring around ADAGIO in the morning. Day Three: Ian deployed our wire-line fishing gear with our electronic strike alarm connected via a bicycle tube. True wind speed (TWS) was 10 to 15 knots, and true wind angle (TWA) was 140 to 150 degrees, with a few rain showers off in the distance, scattered, mixed clouds and outbreaks of sun. Day Four: 1st reef main & reacher, light winds. Day Five: TWS 19 to 20 knots, beautiful sailing conditions under sunny skies. ADAGIO surfed to 10 knots whenever the wind gusted to 23+ knots. We averaged 9 knots boat speed in 20 knots of wind. We furled the reacher at 24 knots TWS, and later furled the jib. We sailed along at 8 to 9 knots of boat speed under first reefed mainsail. From today until landfall in New Caledonia, our TWS ranged from 22 to 30 knots, with seat state of 3 to 4 meters. Day Six: we entered the great Southern Lagoon at the east entrance to Havannah Passage. After checking in at Port Moselle and a quick re-provisioning with beautiful local produce and French cheese and bread, we took advantage of a brief weather window to make for our favorite cruising area around Ile des Pins. After anchoring in Baie de Kuto and we were soon walking on the beach, enjoying the soft, white sand, coconut palms and Bugny trees. Our friends of fourteen years, Cleo and Albert, looked after us, including hosting a party for Ellen’s birthday. Ellen and Ian climbed the 262 meters elevation to the peak of Pic Ngâ “Mountain”, flying their kites from the top. We followed trails around the shoreline, through beautiful forests of Pandanus and Columnaris pines, and snorkeled in Kanumera Bay. In July we joined our friends, Frank and Lisa, of the catamaran MANGO MOON, to sail to the Loyalty Islands, first visiting Lifou, then Ouvea, and then to Lifou again. Our overnight sail from the Southern Lagoon to Lifou was fast and comfortable, with following winds and seas, and no hazards to avoid as we were sailing in the ocean again, unlike our passages to and from the Isle of Pines during which we have had to wind our way through coral reefs and islets. A crescent moon, in rain-catch position, graced our night sky, near the horizon, and a creamy Milky Way beamed overhead. At Lifou, we carefully worked our way through the coral heads to anchor offshore from the town of Doueoulou (or Dreulu). That evening at sunset we all saw the “Green Flash” as the sun dipped below the horizon. Amazing. In the morning, Ian and Ellen paddled the kayak ashore to visit the village. We piled into our catamaran tender ALLEGRO to follow Frank and Lisa to some of the underwater caves located in the lee of the high fossilized coral cliffs south of us, at Cape Mandé. Acres and acres of coral shelves spreading out from the bases of the cliffs, support every kind of hard coral you can imagine, in all colors, shapes and sizes, all in excellent condition. 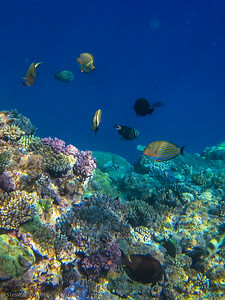 We watched fish we had never seen before, both above the coral shelves and in the deep blue waters surrounding the shelves. The conditions for underwater photography were excellent. 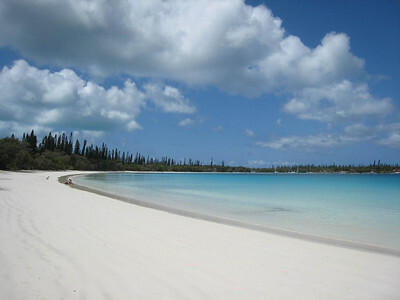 After two days, we raised our anchor and sailed north along the beach of Xepenehe Bay, or Santal Bay, which extends over 50 km, from Cape Mandé in the south to Cape Aimé Martin in the north. We set our anchor in a sand patch between coral heads near the towns of Xepenehe and Easo, sheltered from the forecast easterly and northeasterly winds. Frank and Lisa had told us about the natural dinghy harbor ashore, which one would want to use only in calm seas. We hired a car to explore the island. The vanilla factory was a highlight, as the beans were spread outdoors on tables and a kind woman described the process to us. Inside the shop I photographed a large poster that explains the vanilla processing in detail. No wonder real vanilla costs so much. We walked the 200+ stair steps to see the colorful, coral-filled lagoon at the foot of the 40 meter-high Jokin Cliffs. Wonderful. The town of Wé was a combination of traditional and modern buildings. We were late to the farmers’ market, but enjoyed it nonetheless, and visited the small marina. Surrounded by a fence, the Wetr District grande chefferie (17 tribes) in Hnathalo has one of the finest traditional huts in New Caledonia. With a thatched roof, walls of bamboo and coconut-palm fronds, and its structure and roofing assembled with natural binding without a single nail, the high chief’s hut measures over 12 m in diameter. Our six hour sail from Lifou to Ouvéa in boisterous tradewinds was a delight. ADAGIO anchored between the Mouli bridge and the new Paradise resort. We walked to the Likeny cliffs, as we had done several years ago, at low spring tide, after enjoying the sea life beneath the bridge. Always spectacular, we wanted to be sure that Ian and Ellen saw the cliffs. We sailed back to Lifou and gave up on the weather improving, so sailed on to Grande Terre and the Southern Lagoon. Much excitement when the fishing alarm sounded and, with all hands on deck, Ian hauled in a large Mahi Mahi. We baked a chocolate cake as we entered the bay at Port Boisé, where we waited for two days until the weather settled down in Noumea. 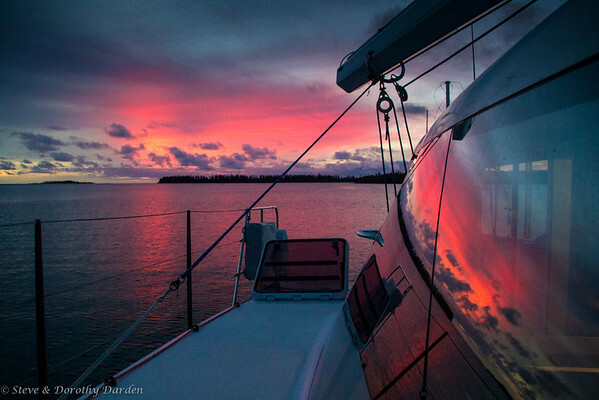 Ian and Ellen left the boat for home in Far North Queensland, Australia. We were fortunate to have had them aboard ADAGIO for three months. During this time Ian and Ellen did more than their share to keep ADAGIO in safe sailing condition, enthusiastically contributed their time and efforts to all of the chores required to sail a boat at sea. In August we returned to Ile des Pins, then in September we sailed once again for Lifou to be with MANGO MOON. After three days in Lifou, we sailed for Noumea, in favorable winds and seas. 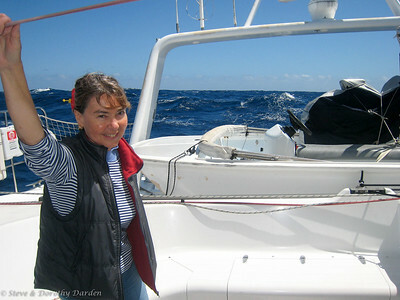 In October our friend Susie Fisher arrived from London, to sail with us to New Zealand. She had been recommended to us by our friend Eva Menuhin, who had sailed this passage aboard ADAGIO the previous year. Susie met Steve at 0830 hours at Bout du Monde cafe, after a too-short night’s sleep in her hotel. After a provisioning trip to the city Marché, I joined Steve and Susie. Steve took all of our passports to bicycle to the numerous government offices to check us out of New Caledonia. Susie and I returned to ADAGIO so that Susie could begin to unpack and so that I could stow my fresh purchases, which included 1.6 kg Yellowfin Tuna, caught locally, 600 grams intended for our friends Cleo and Albert at Ile des Pins. We refueled with a thousand dollars worth of diesel, and some petrol for the dinghy. We hoisted our mainsail in Baie des Citrons, then headed off for Ile des Pins. Susie had a few damp days to explore the Kuto Bay to Vao area of Ile des Pins. On 8 October, we departed Kuto Bay in 15 to 20 knots of wind, we made good but bumpy progress under full main and jib, as the Blood Moon Lunar Eclipse began to peek out from behind the clouds. “Ladies and Gentlemen never sail to windward,” but that’s exactly what we were doing. Our boat speed remained between 6 and 9 knots, so we could not complain. We were rollicking along, with rain clouds all around. Day Three: TWS was 20 to 23 knots, gusting to 25 knots. The seas had risen to 2.5 meters. Day Four: the TWS was 22 to 28 knots. We were averaging 185 nautical miles per day made good. The seas were regularly washing over the coachroof, and some over the radar arch. The TWS remained in the 20s so that ADAGIO’s weather hull lifted enough between seas to let air into the refrigeration sea-water circuit — fortunately Steve has a reliable procedure for restoring circulation (head down in the bilge). As the barometer continued to rise, the motion of the boat eased a bit, so that Steve and Susie could replace the failed Lewmar 130mm block shackle-post with a Dynex Dux soft shackle, free the traveler car and reset the mainsail. What a difference that made to have the mainsail powered again! We celebrated with freshly baked Carrot Cake. As we approached the Bay of Islands, the wind speed began to decrease. Soon we furled the reacher and mainsail and turned on the engines. Over glassy, undulating seas, we went, under a golden quarter moon and bright stars. 15 October — Landfall New Zealand. Our nearly 100% upwind passage ended in bright sun, a half-full orange moon, a gentle sea and light winds. This is a typical ADAGIO landfall. It has been our good luck on most passages to arrive in the sunshine so that we can see the mountains and glaciers. Over the following week we showed Susie around the Bay of Islands, re-visiting our favorite islands, the lovely town of Russell, historic Waitangi and the Te Pahi Islands. We sailed south to Whangarei where ADAGIO was hauled out for a full exterior re-paint, and all that this entails. Susie flew back to London, and we bought a car and rented a pleasant flat. We will miss Susie’s stimulating conversation, level-headedness, and pleasant company. In early December, we flew to San Francisco to visit our daughter, son-in-law and two grand children for the holidays. All is well in our world. When we return to ADAGIO in January, she will begin having her deck hardware re-installed, and we will watch her be returned to her original glory. We wish you the best of holiday celebrations, and a rewarding and adventurous New Year. This entry was posted in 2014 Cruises and tagged Holiday, Newsletter by Steve Darden. Bookmark the permalink. Hey Dorothy, your soft shackles look great and you look great too. I wish you and Steve a very wonderful holiday time and a new year as happy as all the previous ones. Give my love to San Francisco and to Lawton Street where I used to watch the sunset from my window. I’ll be in Russell in February. Will you still be around there? HAPPY ANNIVERSARY, DOROTHY & STEVE!